Comprising but not limited to, variously designed brooches, accessories, etc. 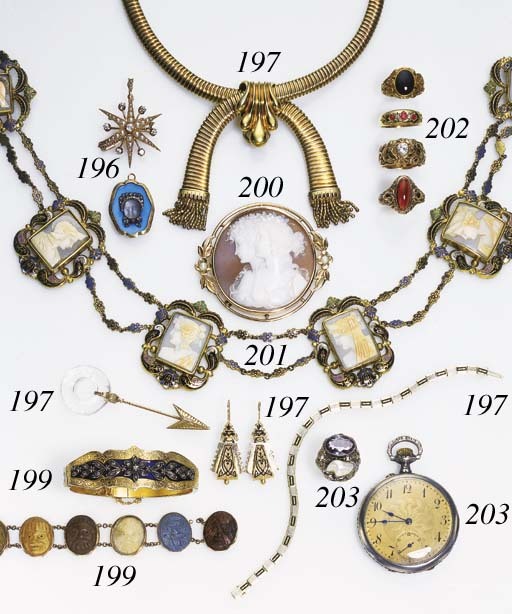 ; highlights include a jabot, designed as a rock crystal circle with arrow motif, mounted in gold; a pair of earrings, each designed as enamel decorated flower head, mounted in gold; a necklace, designed as a faceted ruby and black enamel decorated slide with rope chain, mounted in gold--20 in. ; and a bracelet, designed as rectangular white and black enamel decorated plaques with engraved borders, mounted in gold--7 ¾ in.